To help students de-stress, the Douglas Students’ Union organized the DSU Crafting with Pride event on November 13. The event was hosted in the DSU Building on the New West Campus, where student laughter could be heard echoing through the room. 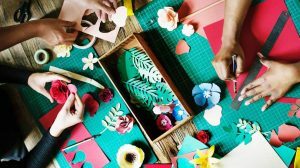 With midterms in full swing and finals around the corner, Crafting with Pride acted as a healthy way for students to drop by and release some of that stress. The table was full of sparkles, colours, brushes, beads, threads, and other art supplies. The artwork was self-directed, so students were able to create anything they wanted to. Participants made a wide variety of crafts and pieces of art including keychains, painting, thumbprinting, and just messing around with sparkles. Stephania Malundo, a Psychology student at Douglas College who was painting a sunrise and making keychains at the event, said in an interview with the Other Press that she had a great time. A 2005 study conducted in Ontario by Ipsos stated, “When it comes to exams, students are experiencing a lot of stress.” According to their data, 40 percent of students experienced high stress surrounding exams, with eight percent going as far to say that their stress levels are extremely high. Zero percent of students reported no stress at all, according to the data, and the closer students were to an exam date, the more stressed they felt. Apart from the stress relief aspect of the event, Crafting with Pride was also intended as a way for students to socialize and meet one another. The DSU Pride Collective was the main organizer. Their aim was to create a space for members of the LGBTQ+ community to hang out with allies and vice versa. Malundo also made it clear that she is no artist but that she thinks the event is more about the social aspect. The World Health Organization labels stress as a major health risk. Stress does not only strike a person based on their age, gender, or size—anyone can be affected by it at any point of life. Members of the LGBTQ+ community are especially at risk, according to Here to Help’s website. To help manage it, Malundo also shared some tips to avoid stressing right before exams.